There’s a lot of talk these days about the importance of personality in social media. And I agree it’s important. Social is about building relationships online and promoting engagement – whether it’s with your friends in your personal networks or your clients and peers in your professional networks. Having personality – literally, the characteristics of being a person, not to mention being an interesting person – makes all the difference in the world. People don’t have warm, intimate relationships with corporate entities. Or their logos. I often hesitate to engage in any discussion or share anything personal with a logo account, whether it’s on Twitter or Facebook. It has been said that social media allows big companies to act like small again. (I think @jaybaer said that, but I can’t find the quote.) Why do big companies want to act small? Because smaller is more intimate and conducive to relationship building. When I first read this piece on integrating a personal voice right in your social media copywriting, I thought the author was onto something. He describes to would-be bloggers and social media community managers how they ought to think and write as a person when representing their corporate brand account online. But as I read, it occurred to me that there was an even better way to get the proper voice into your copywriting. Rather than writing as if your brand is a person, instead I think you should be writing as your own personal brand. 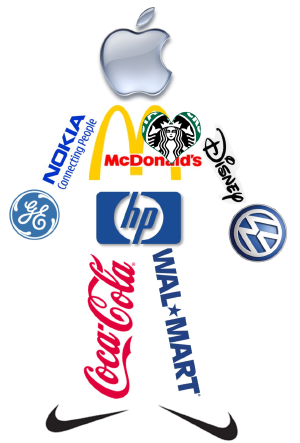 Why pretend your brand is a person? Why get involved in trying to act like your brand would act if it were a person? This requires incredible, almost theatrical, skill to act like something or someone you’re not. And in the end, any personality that shines through your corporate brand will be yours – the personality of the real person behind the brand. My question is simple: Why act? Why not just be your personal brand? Social media has liberated your personal brand and created opportunities for you to make it an asset for your business. Why else would someone be advising you to invest your brand with person-like identity and traits? Because human personality and personal brand trumps corporate brand in the age of social. My advice is to do exactly the opposite of what the piece referenced above recommends. Don’t focus on giving your logo a human voice, focus on liberating and expressing your personal brands. Develop a strategy to harness the power of the personal brands within your organization. Encourage the business leaders and senior employees to develop their own personal brands in a manner that is consistent with and supportive of your corporate brand. Provide them with vision, training and ongoing support to do so. If you do it right, your corporate brand will become animated by real people and grow to be greater than the sum of the personal brands that you support. Why would you want to be a personal brand, playing a person, disguised as a brand – when you can just be yourself and build relationships and engagement much more effectively?